This wonderful facial sunscreen is completely translucent and ultra sheer making it perfect for use under makeup to help protect skin from sun and premature aging. A hypoallergenic and oil-free formula which easily absorbs into the skin without clogging pores. The specially selected antioxidants, grape seed and green tea extract mean your skin will stay moisturised and nurtured throughout the day. Oil free, hypoallergenic & non-comedogenic. Higher SPF gives more sunburn protection. Directions for use: Apply sunscreen liberally to all exposed skin area 15-20 minutes before sun exposure. Reapply as needed after towel drying, swimming or sweating. Children under 6 months, ask a doctor. Aqua (Water), Cetearyl Alcohol, Glycerin, Caprylic/Capric Triglyceride, Dimethicone, Cetyl Alcohol, VP/Hexadecene Copolymer, Glyceryl Stearate SE, Aloe Barbadensis Leaf Juice*, Camellia Sinensis Leaf Extract*, vitis Vinifera (Grape) Seed Extract, Cetearyl Oilvate, Polysorbate 60, Silica, Sodium Stearoyl, Glutamate, Sorbitan Olivate, Tocopheryl Acetate, Xanthan Gum, Alcohol*, Benzoic Acid, Dehydroacetic Acid, Phenoxyethanol. *Certified Organic Ingredient. The Jason Facial Sunscreen SPF20 - 128g product ethics are indicated below. To learn more about these product ethics and to see related products, follow the links below. As I specifically wanted a sun-block for my face, without any nasty chemicals in it, this was a good choice. It has an SPF of 20 and I mix a small blob with my moisturiser every day for extra protection (my foundation also has an SPF but if I wanted to make-up free I have the choice). It does make my oily skin a little shiny but that can be overcome with facial blotting tissues or a light dusting of powder and I know that I am protected which is the main thing. Not smelly and better for your skin than the ones on the high-street. 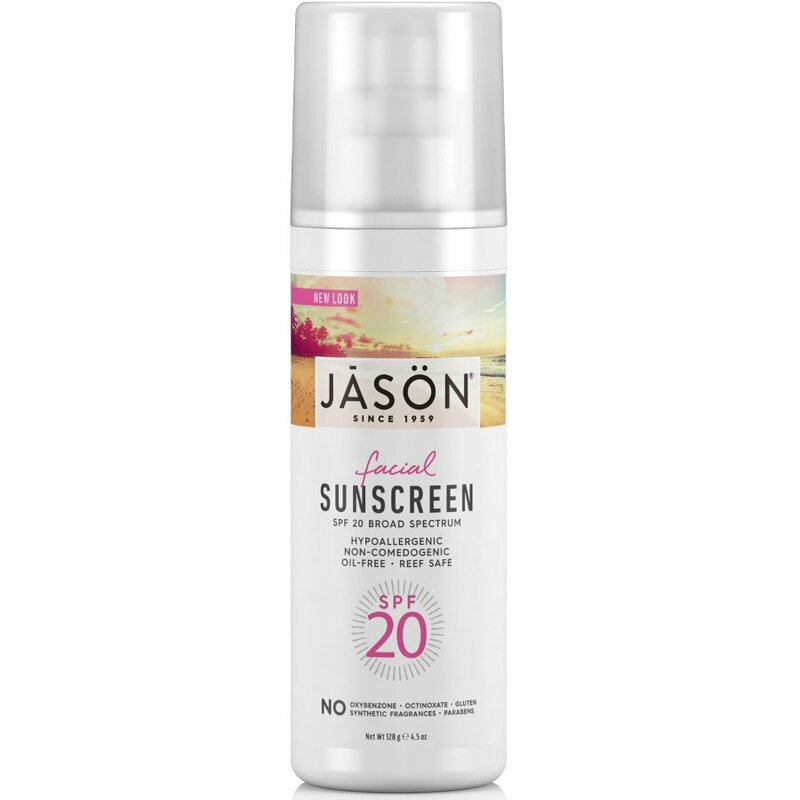 There are currently no questions to display about Jason Facial Sunscreen SPF20 - 128g. JASON Natural Cosmetics believes that what you put on your body is as important as what you put in your body. Combining the science of natural personal care with the best pure and natural ingredients, they provide an effective and environmentally friendly alternative to chemical, mass produced products. Since 1959 JASON has been the foremost supplier of pure and natural toiletries and cosmetics. If you crave high quality, luxury body care sourced only from natural ingredients then you should definitely try JASON.